Jawaharlal Nehru, pictured in the center was the first prime minister of Independant India. 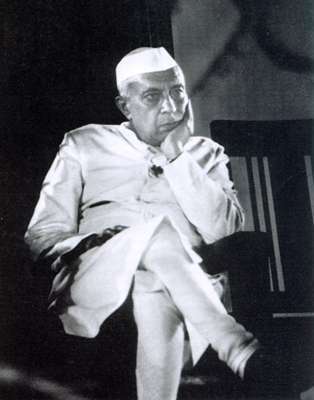 His trademark style included the 'hat' and the trademark "Nehru Jacket". Even now a days the 'Nehru jacket' comes in women's styles also!! The first picture and third picture were taken in R.A. Puram slum in Chennai. 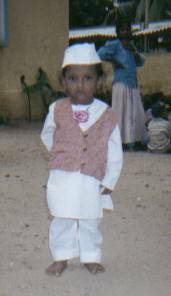 For field work, through Asha Nivas, Nugambakkam, we held a Republic Day function on January 26, 2001. One of the sections of the program was a 'fancy dress' competition, where the children dressed up as famous Indian people, these two children both dressed as Nehru. They are both wearing the hat and coat. They were very cute! Republic Day Parade Spectacular Show - by George J Thaliath - This site details about Republic Day History and a parade that takes place in Delhi. This page has been visited times since its creation: September 15, 2001. Updated May 2004.